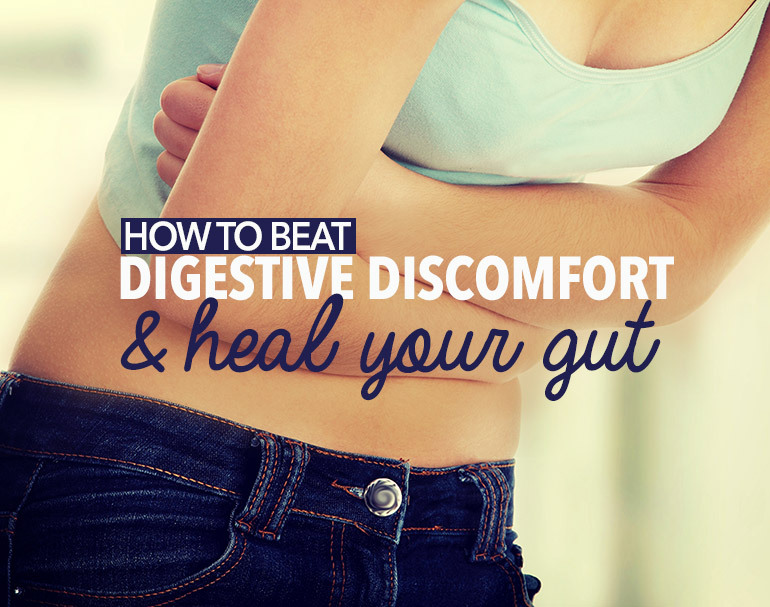 Has digestive discomfort become a fact of life for you? Do you believe that gas, bloating or constipation is unavoidable? If yes, then here’s some good news: a few simple changes can make these digestive ailments a thing of the past. Learn what you can do today to improve your gut function and help it ‘run’ more smoothly. Besides being usually poor in nutrients and high in calories, processed foods are also loaded with sugar and/or high fructose corn syrup; two ingredients that lead to the production of inflammatory cytokines, ‎an excess of which has been associated with ‎digestive disorders 1. A highly processed diet also favors the growth of pathogens in our gut. These bad bugs have no digestive function and can gradually destroy the gut’s lining and function by producing dangerous endotoxins and upsetting the delicate ecosystem in the gut. This increases the risks of developing a leaky gut, one that is unable to prevent toxins or bacteria from entering the bloodstream 2. A damaged gut also worsens inflammation. Start reading food labels and avoid products that list sugar among the first three ingredients or those that contain any kind of syrups (fructose, inverted, golden, glucose and so on). Keep a food diary to spot foods that are high in sugar or fructose – try to reduce the consumption of these foods one at a time. For instance, if you drink 8oz of soda daily either substitute it with water every other day or gradually decrease your consumption by 1oz every week. Eat more whole foods – this way you won’t have to scrutinize food labels that often. Use virgin coconut oil for cooking. Make your own salad dressing using extra virgin olive oil and apple cider vinegar (or any type of organic vinegar) instead of commercial dressings or mayonnaise – these often contain seed oils. Pepsin: The enzyme released by the stomach which initiates protein digestion. Pancreatic amylase: Involved in carbohydrate digestion. Pancreatic protease: Responsible for the bulk of protein digestion. Pancreatic lipase: Breaks down dietary fat into monoglycerides and free fatty acids. Healthy bacteria: These are also involved in vitamin production and absorption. Incorporate some of the spices below into your diet. These spices can help increase bile secretion, which will improve the digestion and absorption of fat and fat-soluble vitamins, and stimulate your pancreatic enzymes and increase lipase activity 6. They can also help to decrease food transit time by making the digestive enzymes and bile acid more available, thus accelerating the overall digestive process and improving nutrient absorption 7. A reduced food transit time in the intestines has also been linked to reduced risks of colon cancer, and can also alleviate constipation 7. Turmeric. Add some turmeric powder to curries or in marinades. You can also have some turmeric tea: simply allow 1 teaspoon of finely grated fresh turmeric to steep in hot water for 3 minutes; strain; add in a quarter teaspoon of fresh lemon juice or some raw honey (optional) and drink. Fenugreek. You can add a pinch of grounded fenugreek to mashed sweet potatoes, curries or chickpea salad. To make fenugreek tea, allow 1 teaspoon of fenugreek seeds to steep in a cup of boiling water for 5 minutes; strain and relish with a little bit of raw honey. Garlic. Add some freshly minced garlic to stir fries, soups and curries or use whole cloves when roasting beef or grilling fish. Ginger. Add grated ginger to stir fries or casseroles or when preparing sweet and sour dishes. You can also make ginger tea by adding a teaspoon of minced ginger to some boiling water or green tea. Fresh pineapple 8,9 and papaya 9 have been shown to improve protein digestion in individuals who lack sufficient digestive enzymes. These two fruits contain enzymes (papain and chymopapain in papaya and bromelain in pineapple) that help breakdown protein into amino acids. Eat a slice or two of either fruit 10 minutes before your meal. You can also use the fruits in green smoothies. Avoid taking non-steroidal anti-inflammatory drugs (NSAIDs) or acid-suppressing medications. Practice stress-reducing activities and sleep before midnight. Glushakova, et al. (2008) Fructose induces the inflammatory molecule ICAM-1 in endothelial cells. Journal of the American Society of Nephrology9: 1712-1720. Morley JE. (2007) The aging gut: physiology. Clin Geriatr Med.;23(4):757-7. Pirlich M, Lochs H. (2001) Nutrition in the elderly. Best Pract Res Clin Gastroenterol. ; 15(6):869-84. Wintergerst ES, Maggini S, Hornig DH. (2007) Contribution of selected vitamins and trace elements to immune function. Ann Nutr Metab.;51(4):301-23. Platel, K., & Srinivasan, K. (2004). Digestive stimulant action of spices: a myth or reality? The Indian journal of medical research, 119(5), 167-179. Platel K, Srinivasan K. (2007) Studies on the influence of dietary spices on food transit time in experimental rats. Nutr Res ; 21: 1309-14. Taussig SJ, Batkin S. (1998) Bromelain, the enzyme complex of pineapple (Ananas comosus) and its clinical application. An update. J Ethnopharmacol.;22:191-203. Shils ME, Shike M, Ross AC, eds. Modern Nutrition in Health and Disease. 10th ed. Philadelphia, Pa.: Lippincott Williams & Wilkins; 2005.